Custom Coin frames can be made to fit your specific German, Austrian, Maria Theresa Thaler and Commerative Fest coins. We also offer manufactured rope and plain coin frames for your Commerative Fest Coins, US Silver Dollars and most German and Austrian Coins. Filigree Coin Frame Pendant with genuine 1 DM coin. Custom CF100 Coin Frame with Silver German 5 DM Coin. Supplied with sterling jump ring, not shown. Sterling Silver Pendant bail available. 38.1mm and Larger: Silver Dollar, Fest Coin, Maria Theresa, etc. 38.0mm and Smaller: 10, 5, & 2 DM, 500, 50 & 25 Shilling, etc. NOTE: COIN NOT INCLUDED, BUT AVAILABLE. Please call for avaibility. 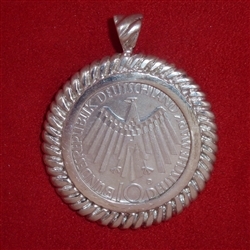 Filigree Coin Frame Pendant with Genuine Austrian100 Schilling coin. 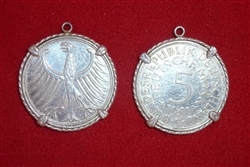 Filigree Coin Frame Pendant with Genuine Austrian 50 Schilling coin.